Hot and humid weather greeted our runners from NB in Ottawa for our first bus tour to the Ottawa Army Run and the race lived up to the hype and expectations with an amazing atmosphere, beautiful weather and a fantastic course. Of course, New Brunswick, for a small Province always delivers with great results and Sacha Hourihan won the Ladies Half Marathon overall, one of many great runs over the day. Enjoy a few photos from race day and thanks to everyone who traveled with us. Latest News – Army Run, Ottawa – excited to report that the Race Organizers of the Army Run in Ottawa have agreed to give our group a 25% discount on any of the race day registration fees. Join us on our brand new tour to the beautiful city of Ottawa and the amazing experience of the Army Run in Canada’s 150th year. We are based in a city centre hotel so this tour will appeal to runners and non-runners alike, with a 6 minute walk to the Expo and Race Start. 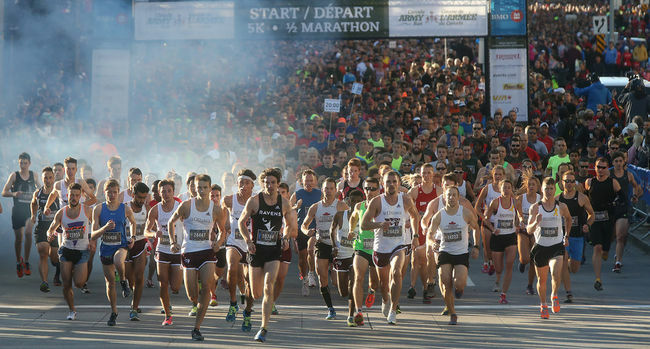 There are 3 race distances to consider, a 5k, 10k or Half Marathon or the Commander’s Challenge where you can participate in both 5k and Half Marathon in one great morning of racing. Participants who register for the Commander’s Challenge will receive a unique bib and race shirt. In addition, upon completion of the challenge, participants will receive a special coin as well as their dog tag medals. All prices per person. $100.00 per person deposit. Balance due 8 weeks prior to departure on 21 July 2017. Minimum 25 people required for this group departure otherwise pricing may be affected. If you are travelling from out of town we can offer you accommodation at our B&B on Seely Street. We will offer you a great rate of $75.00 per room, plus tax. Your car can be parked at our house at no extra charge at your own risk. Registration – We may be offered a Group Discount for Registration so do not register without contacting us first.